"Dr. 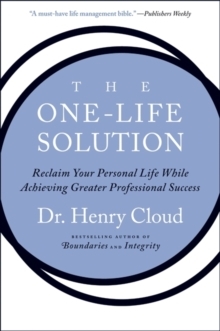 Cloud will show you how to produce the results you are looking for in your work and personal life."-Dr. Phil McGraw, #1 New York Times bestselling author From Dr. Henry Cloud, the million-copy selling author of Boundaries and Integrity, comes The One-Life Solution, an essential handbook that demonstrates how establishing a successful, happy, and rewarding business career can be achieved by setting physical, mental, emotional, and spiritual boundaries. Anyone who finds the chaos of the workday spilling over into their personal and family time-everyone who has ever wanted to have more control over the work and home aspects of their life-will find valuable answers in The One-Life Solution.